Every XPR-10AS features Direct-Drive technology that’s only available with BendPak. The asymmetrical design of this lift has rotated columns, which makes it easier to enter and exit the vehicle and reduces the chance of door dings and dents. If you have a 12’ ceiling, you can have this lift in your home today—in wide or narrow installation! 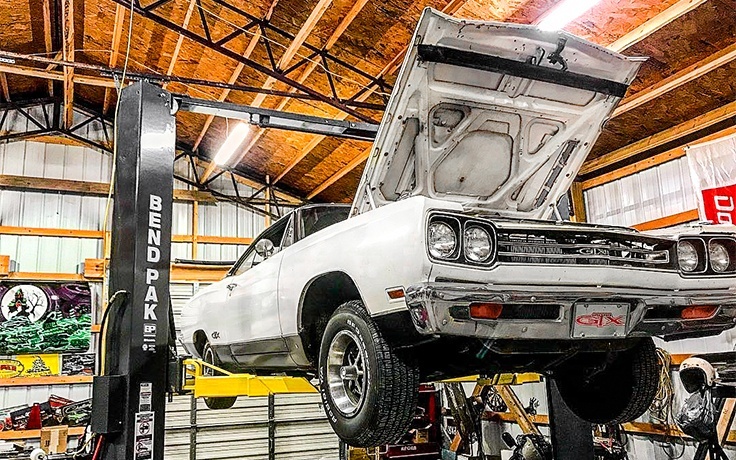 A 10K capacity BendPak car lift is a smart addition to any shop or garage. Professionals love the power and reliability of the lift, and they know our reputation precedes us. Meanwhile, DIY’ers with high ceilings know BendPak means safe lifting in the comfort of home. Skip the headache of an uncertified, poorly welded piece of garbage and trust our best to lift your best. Our XPR‐10AS asymmetric two‐post lift offers the convenience of wide or narrow installation, all in one configurable package. 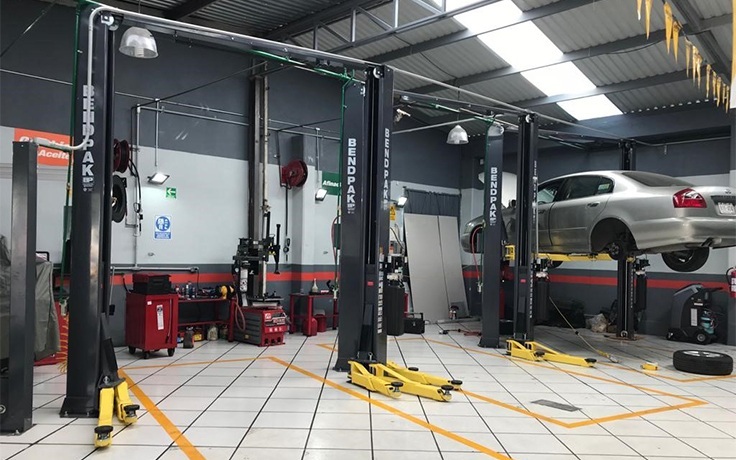 This durable, safe and reliable car lift features expandable top beam and Tru‐Metric arms to suit virtually every vehicle lifting requirement. The simple yet highly sophisticated lift design keeps service and maintenance costs to a minimum, delivering lower operating expenses and higher productivity. These true asymmetric lifts feature 30° rotated columns for added door‐opening clearance and interior car access. The exclusive Tru‐Metric carriage and arm design combines to give users the ability to load vehicles either symmetrically (centerline of vehicle at column) or asymmetrically (centerline of vehicle behind column). All asymmetric models features rotated columns for added clearance when opening vehicle doors. At the same time, swing-away arms provide a larger drive-thru clearance. These models feature the exclusive Tru-Metric arm design to provide variable arm-position configurations—either symmetric or asymmetric, providing greater versatility for greater service capability. It's like having two car lifts in one! BendPak XPR-10 two-post lifts feature low-pressure HVLP Direct-Drive cylinders: no more lifting chains or screws. Dual HVLP low-pressure cylinders minimize leakage, offer better reliability, smoother operation and fewer maintenance costs throughout the life of your lift. High volume and low pressure equates to less workload placed on the entire hydraulic system. 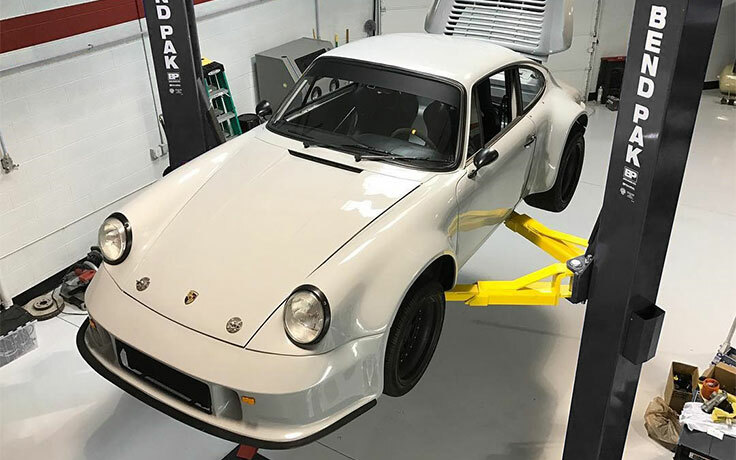 Direct-Drive technology is preferred on commercial-grade two-post car lifts, as it has it has fewer moving parts than a chain-over-roller cylinder configuration. Pressurized hydraulic fluid flows from the power unit to the hollow cylinder rods, entering the cylinder body and filling its internal cavity. The pressure of the hydraulic fluid extends the piston rod downward, raising the cylinder body and lift carriages. A dual-synchro equalization system maintains equal lifting and provides operators with a stable, level vehicle working condition. 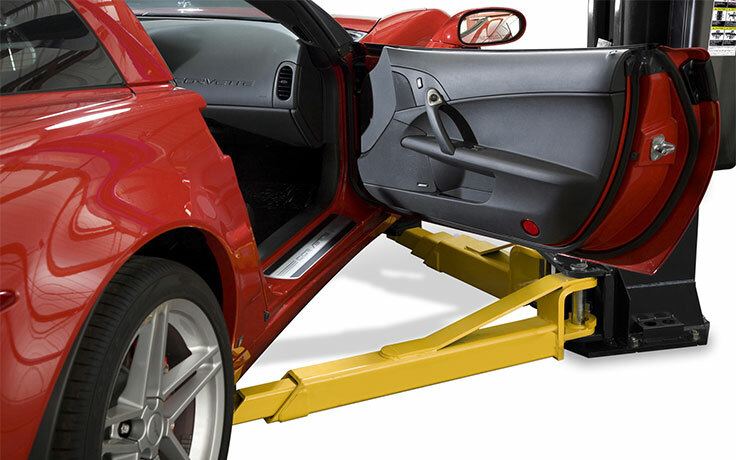 Double-telescoping screw pads come standard with every asymmetrical 10K car lift. 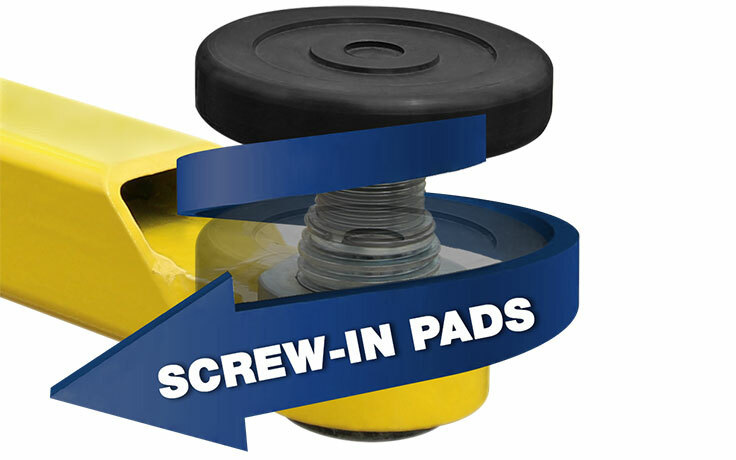 These polyurethane pads are ideal for intense shop environments and busy mechanics who can’t afford money-sucking downtime. 63 mm stackable adapters are included for even more versatility. Get under more cars with these low-profile contact pads. A dropped-end frame makes servicing more vehicles easier than ever. The two-post lift accommodates almost every wheelbase. The pads can be extended or retracted in almost any imaginable configuration. Arm tube supports on other lifts have a tendency to scratch vehicle doors. We made ours lower to the ground, so they avoid contacting and damaging vehicle doors. As soon as the car lift arms rise, arm restraints engage automatically. They disengage when the lift carriage descends, making them easy to reposition once the vehicle is completely lowered. 53” lift carriages are taller than other manufacturers’ carriages. This reduces stressed placed on the load bearings, as well as the columns. It also extends the life of your lift. UHMW load bearings never need to be lubricated, and they last forever. That’s why a BendPak two-post lift never features weaker, old-fashioned roller bearings. 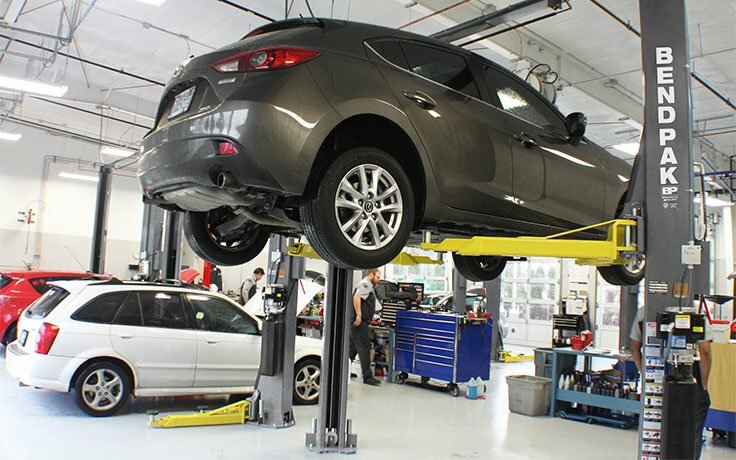 By ensuring each lift column is made from a single piece of steel, we provide the highest-quality support system for your vehicle. 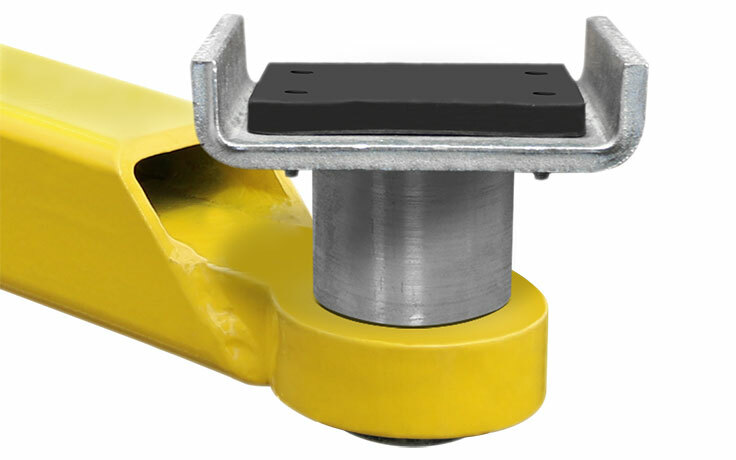 The single-point safety release makes the car lift easier and safer to operate. Dual-synchro equalization means both lift carriages rise at the same time, and the telescoping arms remain stable and level in the carriage. Integrated into every XPR-10 Series hydraulic cylinder is a one-piece, pilot-fitted machined steel piston that is wrapped with specially designed, pressure-loaded U-cup piston seals, backups and wear bands that virtually eliminate any fluid bypass. The micro-smooth chrome-rod is machined from high-yield, ground and polished C-1045/50 micro-alloy steel and plated to a minimum of .001" diametrically, to ensure superior cylinder operation and life. The better-designed, high-durometer, mechanically loaded rod seals make rod leakage a thing of the past, while a specially formulated abrasion-resistant urethane rod wiper provides exclusion protection. The welded cylinder body is made from robust steel tubing that exceeds ASTM specifications. Free-flow, high-pressure 3/8" hydraulic lines, high-flow pump and integrated AC power unit work together to make a speedier two-post lift. A padded shutoff switch extends across the top of the overhead beam, automatically stopping lift movement when activated. Vehicles with hard-to-reach or uncommon lift point spreads (such as older vehicles and some electric cars) require BendPak’s Low-Pro arms. They’re perfect for sports cars and professional race cars too. If you need more headroom for your cars and trucks, the XPR-10AS-168 more easily accommodates high-rise vehicles. Even those nifty Sprinters will fit comfortable in this extended-height car lift structure. A Clearfloor two-post lift keeps an unobstructed space below and runs all wires and hoses above. This makes moving about a little easier and protects sensitive components. My New BendPak 2-Post Lift! Click the button below to add the BendPak XPR-10AS 168 Extra Tall 168" Asymmetric Two Post Lift 10,000 LBS Capacity to your wish list.